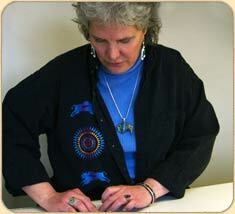 Val makes and designs all her own patterns. 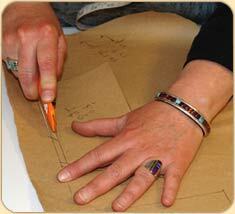 The stones are flat-cut into cabashons for a strong inlay. 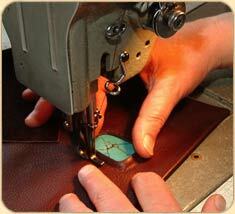 Since 1972 Valerie has owned and operated five leather goods stores. I purchased one of your bags on vacation and I LOVE IT!!! You make a great bag, and I was pleasantly surprised with the price. We received your shipment today and sold one buffalo bag and ALL of the cell phone cases within 1 hour! Send more! I love my new Satchel with turquoise! It is obviously well made and feels great! Our store had the top sales in our complex last year thanks to your beautiful bags. People really love them!